Built in Croatia by the Uljanik Shipyard in 1991 as TRELSI, and operated for a time by Stenersen Tankers, this 138.9 metre long, 14,800 tonne deadweight tanker was renamed EURO SWAN in April 2001. Now owned by Uni-Tankers A/S and working for Brostrom Tankers, EURO SWAN flies the Danish flag. 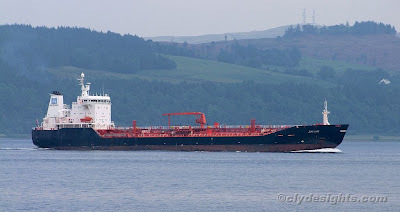 She was seen heading for Brodick Bay after she had delivered a cargo of fuel from Mongstad.